ROARING FORTIES™ SMA1060 series Inflatable PFD Type 1 is designed to suit welders, construction workers and fire fighters working near/in marine environment. 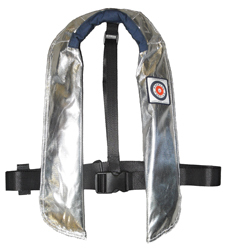 This inflatable PFD's design is based on our SMA1060 series & is shielded by an Aluminum coated fibre glass fabric. The fabric has fire and sparks retardant properties which prevents embers and weld slag from damaging the inflatable PFD/lifejacket. The SMA1060FR series is light weight with all the safety protection features required by the welder. The PFD is non-cumbersome providing comfort to the welder in both standing and sitting positions. It also give the welder full freedom of movement during work.